Tell me more about Audaces Pattern! Your modeling is definitely in the digital age. Create patterns from scratch, then manipulate in one click, automatically set gradients, and check out the measurements with all the ease the digital process delivers. Audaces Pattern is an intuitive and easy-to-use solution that streamlines all the modeling work. With the 4DAlize technology, you extract pre-modeling and accelerate the start of the job. 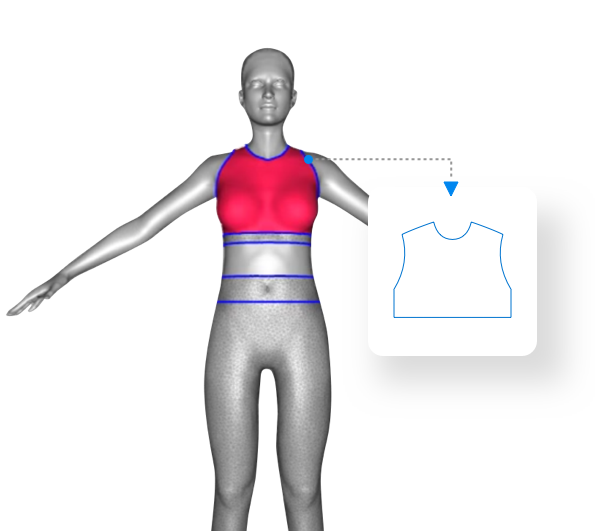 The clothing is created directly in 4D, already with real dimensions, and through cutouts, flat shapes are extracted for adjustment and refinement, delivering the final modeling quickly and with precise trim. Audaces 360 has an intuitive interface that allows you to simply and quickly, create templates safely, scale and modify existing databases, right on your computer. Grade bases and create impressive markers with just a few clicks. Develop patterns strait on your computer or simply alter existing bases. Grade your patterns in a simple and dynamic way and reach the quality you aim for in a fraction of the time. Create patterns with precision, save time grading bases and create quality markers easily. Our patterns system is the favourite among professionals of the fashion industry and among the biggest and best fashion schools around the globe. define the sewing process in a simple way when cutting the patterns. This tool gives the professional a range of options of threads to choose from, as well as the directions of the warp yarns the cutting will be made.